Lynn assisted us with finding this special property. She was so pleasant, helpful and knowledgeable. 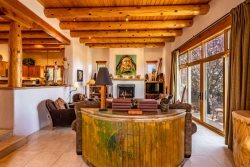 Todd also has offered great guidance in our many times of renting through Casas de Santa Fe. We absolutely LOVED our entire visit! I had minimal experience with your team, but was greeted well upon arrival and when we had some trouble with the internet, received assistance promptly. As mentioned above, it was excellent. Beautiful property in a fantastic location. Steps to Canyon Rd. and minutes to the plaza. Beds were very comfortable which is important. It was very quiet and we loved the back patio, had breakfast outside every day. Common spaces were the perfect size for our needs. great place.